Kids learn Arithmetic while they have fun playing card games. Addition, subtraction, multiplication, and division facts are easy when your kids are learning at the same time they play popular games they already know and love. Games include Memory, Go Fish, Old Maid and War. Special Ed teachers use these fun Arithmetic Card Games to help teach arithmetic to children with learning disabilities such as ADHD, sensory processing disorder, and dyscalculia. The Arithmetic Card Games integrate perfectly with all math programs used in schools across the country. Help your child learn arithmetic facts. No more boring math drills! Scroll down to read what teachers and parents say about these great Arithmetic Card Games. Pick up the 4 Sets of Arithmetic Card Games Today for Your Kids and Download Immediately. Digital Download: 1 PDF file with directions per set. Contents per set: 46 2" x 3.5" playing cards plus Old Maid (All 4 games per set use the same deck), 3 Answer Key Cards, directions for playing games. Materials Required per set: 5 sheets 8 1/2" x 11" plain or perforated card stock for printing cards. 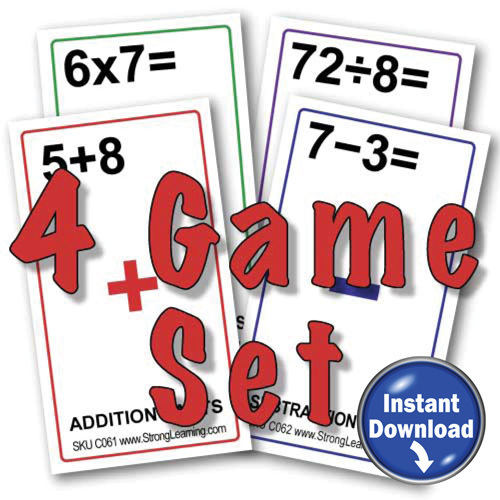 Order all 4 Arithmetic Card Game Sets Now for Your Kids and Save! Download Immediately.